Spain's not just family friendly – it's adult friendly, child friendly and even loved by those sometimes 'terrible teens'! Every activity, sight and attraction seems to have something that appeals to all three. Waterparks marry gentle slides with thrilling rides, Spanish menus cater to delicate and adventurous palates and sports range from leisurely to high octane. Throw in the year-round sun and breathtaking beaches and you've got all the ingredients for amazing family holidays in Spain. 12 months of golden rays, 365 days of Spanish warmth – you can always find a spot in the sun! The mainland, Canaries and Balearics are the three pillars of Spain's year-round appeal. March on the mainland sees average temperatures of 20°C, rising to 30°C in the summer and cooling only slightly as autumn begins. The Balearics bask in average temperatures of 25°C and above from May to September. And if you want to explore these islands in a slightly cooler climate, 20°C in October feels just right. 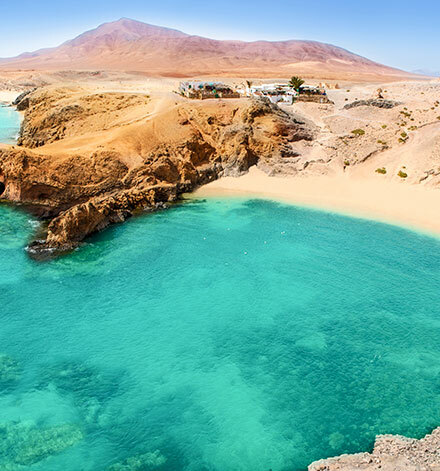 Then there's the Canary Islands, where the sun's always shining and average monthly temperatures stay in the 20's all year long. Catching a wave, pedalling away or just paddling at a leisurely pace – Spain spoils its visitors for sporty choice. What better way to bond with your little ones and use up some of their boundless energy? With offshore winds blowing along Canary island shores, there's nowhere better to hop on your board. Whether that's for windsurfing, kitesurfing, or a straightforward surf, that's completely up to you. Trade winds blow at different intensities along its coastlines, so there's a breeze for all abilities. On the Balearic Islands, Mallorca has made a name for itself as a cycling hotspot. Pro peddlers flock here for warm weather and to tackle challenging mountain trails. These are ideal if your children are older, adventurous and ready to put peddle to the metal! Seafront paths are ideal for younger kids, offering a smooth and flat ride for your little cycling enthusiasts. 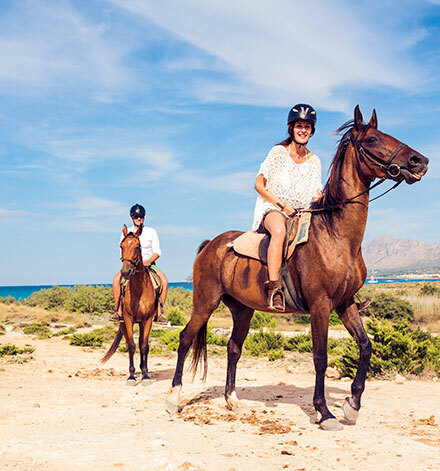 From one saddle to another, Menorca is the perfect spot for some family horsing around. Trot and canter along the Cami de Cavalls, a majestic path that wraps around the coastline. Prepare for some stunning views from your noble steed. There's more two-wheeled fun to be had on the Mainland, where Costa Blanca offers family-friendly cycling. Away from traffic, a quiet path follows the old train tracks to Torreviga's salt lakes. Pretty in pink, one of the lakes is a mesmerising flamingo shade – so you'll definitely want to pack your camera! Andalucia's calm seas make it a snorkelling spot for young and old, so you can enjoy peeking under the waves together. While Costa Calida's warm waters are ideal for stand up paddleboarding, giving you a pleasant splash when you can't quite keep your balance. Sometimes the answer is just sitting there on the table and staring you in the face. Like one of those lightbulb moments where the switch flicks and you've got it! 'Little dishes for your little holidaymakers'. Tucking into tapas is ideal for all the family, even if your kids are fussy eaters. They can pick at several small dishes, deciding which ones they like best. So there's no mealtime meltdowns or cries of 'mum, dad, I don't like my dinner' – just savour the flavour and enjoy the peace. Ordering from the same menu, seeing their dinner arrive on matching plates – they'll feel like they're on the same cultural and culinary adventure. Younger taste buds might just require some more careful decisions. Patatas Bravas are bound to be a favourite, with cheese and tomato sauce dolloped onto cubed potatoes. Albondigas are tasty Spanish meatballs, swirling around in tomato and garlic sauce. Croquetas are little fritters of fun, letting them bite into the familiar flavours of ham, cod or potato. And who doesn't like a meaty skewer, or breads thickly slathered with tasty toppings!? Of course, you don't have to eat like this every night. 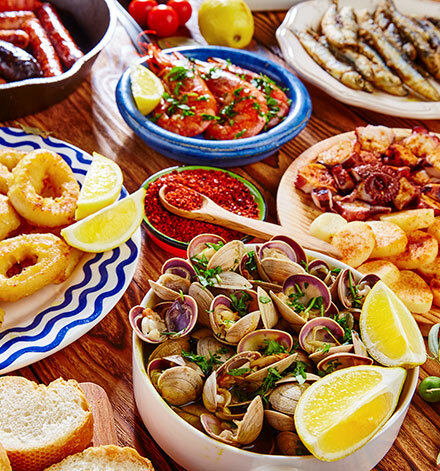 You'll find international restaurants all over Spain, so those familiar favourites are never too far away. Building sandcastles, first dips in the sea, frolicking on the sand – some of those best family memories are made on the beach! And Spain has golden stretches for every taste. So where better for some sandy fun with your little ones? 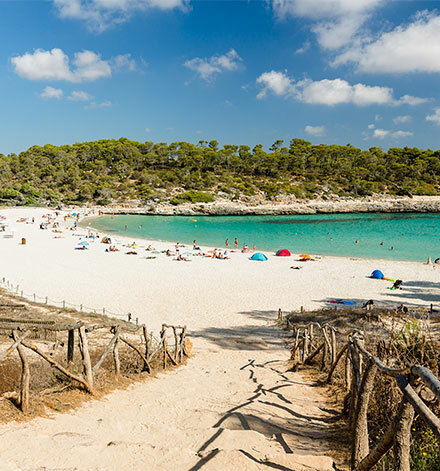 The Balearic Islands are a tempting treasure trove of amazing beaches. Wide stretches with plenty of play space meet quiet coves for relaxed family time. Warm and calm waters let you splash around without a worry in the world, so expect big grins and lots of laughter. Imagine your kids' excitement when they lock eyes on a dark beach of black sand! Their eyes as wide as those Canary Island volcanic craters. Towering mountains and craggy cliffs create wonderful scenery as you enjoy that beach time together. There's plenty of golden stretches here too, with Gran Canaria's Maspalomas the pick of the bunch. Its long stretch blends seamlessly into the dunes behind, creating desert-like coastal beauty. When it comes to the coast, the Mainland is a lot like the Balearics. You'll find quiet coves, bays with calm waves and plenty of family friendly entertainment. It's just a case of finding your favourite spot. You should never judge a book by its cover, but resort names are a helpful hint of what you can expect to find on Mainland Spain. Head for Costa Blanca and the 'White Coast' offers up stretches of ebony among the fine golden sand. More than 320 days of sunshine await along Costa Calida and the Costa del Sol, ideal for family beach trips. What more would you expect from the 'Warm' and 'Sun' Coasts? It might sound like a bit of a cliché, but those splashy amusements really are ideal for all ages. Picture your whole family clinging onto an inflatable as you zoom through twist and turns. There's nothing better for bonding than the chorus of shrieks and laughter that comes with the adrenaline rush. Maybe you fancy some family competition? Let your inner child loose and race your little ones to the bottom of a slide. A little friendly rivalry never hurt anybody! It's tough to keep up with that boundless young energy, so lazy rivers seem like tropical mirages when you start to tire. Slip into an inflatable and float into blissful relaxation. 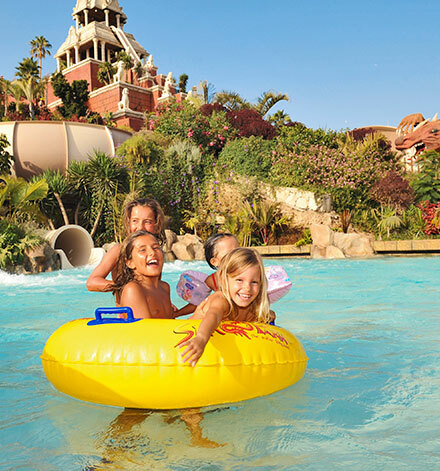 Spain really makes a splash when it comes to waterparks! Not a lazy cannonball of a splash, but a precise and calculated leap that creates a majestic fountain of spray. There's some real gems and unique parks on these shores. Tenerife offers a taste of Thailand, in the form of Siam Park - where the floating market meets wonderful Thai architecture. On the Balearic Islands, Mallorca's Hidropark claims to offer "the best family fun ever". A bold claim backed up by mini golf, trampolines and giant floating orbs. So you can putt, bounce and hamster-ball your family into a world of fun and frolics. Back on the mainland amazing views belong to those brave enough to keep their eyes open. 33m high and built into the hillside, Aqualandia's 'Vertigo' is a rush and splash of pure adrenaline overlooking Benidorm.